Club3D introduced a new GeForce GTX 560 TI featuring 2048 MB GDDR5, the card has a MSRP of 245EUR ($329) including VAT. Clockspeeds are 822/1645/4008MHz (core/shaders/memory). 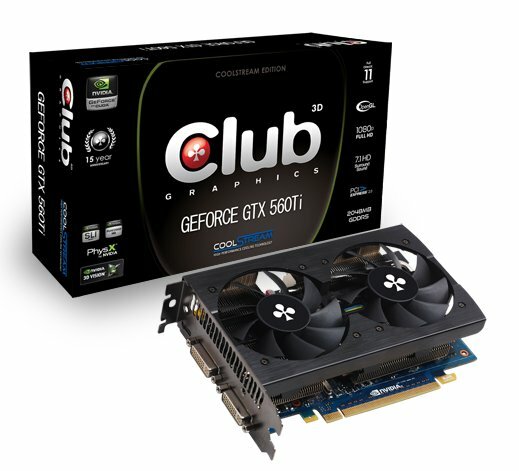 Club 3D launches the ultimate GeForce GTX 560TI featuring 2048 MB GDDR5 with the award winning CoolStream technology featuring the ultra efficient dual fan and high performance heatpipe design. This card is the excellent choice for silent, high performance systems and furthermore the perfect upgrade for the latest generation of PC games like Battlefield 3, The Elder Scrolls V:Skyrim and Batman: Arkham City! This new card offers a better performance at the nowadays more common 1920 x 1200 or 1680 x 1050 resolution than the standard GeForce GTX 560TI with 1024 MB, remains cooler with the ultra efficient dual fan design versus original 1 fan design and runs out of the box the new Open GL 4.2 standard. Immerse yourself into a whole new level of detail and realism with 3D Vision™ Surround enabled gaming which "requires two graphics cards in SLI configuration". Experience stunning visual environments and an ultra-realistic multi-player battlefield. Discover the incredibly detailed world of DirectX® 11 with the Club 3D GeForce® GTX 560Ti CoolStream Edition graphics card. With up to 3x the performance of previous generations and loaded with all the latest gaming technologies the Club 3D GeForce® GTX 560Ti CoolStream Edition delivers a gaming experience that will blow you away.